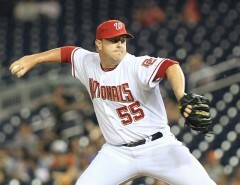 Reliever Matt Capps will be representing the Washington Nationals in the 2010 MLB All-Star game in Anaheim. This will be his first All-Star Game. The selection of Capps to the All-Star team is quite emotional for the pitcher having lost his father to a heart attack last October. Capps is second in the major leagues with 22 saves this year. The right-hander might not be the sole National representing Washington in sunny California for the mid-summer classic. The 2009 Gold Glove and Silver Slugger winner Ryan Zimmerman could be added to the roster at third base pending fan votes. National League team manager Charlie Manuel added Zimmerman to the Final Vote fan ballot along with Heath Bell (Padres), Carlos Gonzalez (Rockies), Joey Votto (Reds), Billy Wagner (Braves). To vote, visit the MLB website before Thursday at 4 p.m.